The discovery of new metal nitrides by CDAC summer undergraduate intern Andrea F. Young (on left in picture at HPCAT) has been published in the April 21st issue of Physical Review Letters. 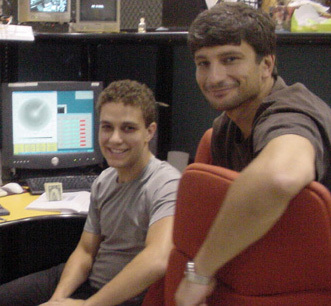 As the first author of the paper, Andrea published the work with E. Gregoryanz (former CDAC Scientist, now at the University of Edinburgh, right in picture), C. Sanloup (Universitie Pierre et Marie Curie), S. Scandolo (Democritos National Simulation Center in Trieste), and R. J. Hemley and H. K. Mao ( Geophysical Laboratory). Two new transition metal nitrides, IrN2 and OsN2, were synthesized using laser-heated diamond-anvil cell techniques. Synchrotron x-ray diffraction was used to determine the structures of novel nitrides and the equations of state for both the parent metals as well as the newly synthesized materials. These new compounds have bulk moduli comparable with those of traditional superhard materials. 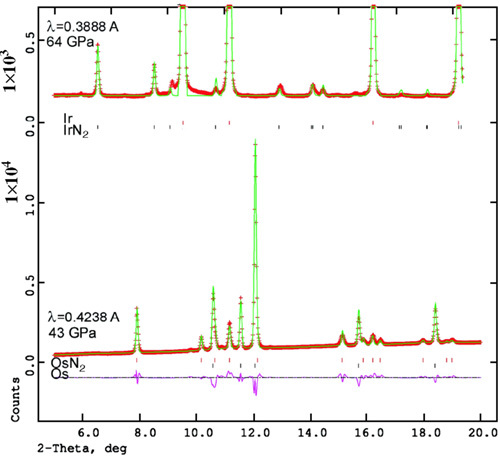 For IrN2, the measured bulk modulus [K0 = 428 GPa] is just below that of diamond (K0 = 440 GPa). Ab initio calculations indicate that both compounds have a metal:nitrogen stoichiometry of 1:2 and that nitrogen intercalates in the lattice of the parent metal in the form of singly bonded N-N units. [A. F. Young, et al., Phys. Rev. Lett., 96, 155501 (2006)]. Young was also the first author of a theoretical study of PtN2 that just appeared in Physical Review B. [A. F. Young, et al., Phys. Rev. B, 73, 153102 (2006)]. The latter work was carried out by Andrea during a internship last summer in Trieste at the Democritos National Simulation Center. He is finishing his studies at Columbia University will be starting graduate school in Physics.